Client’s insight on patient-centered care and why it matters to the private practice owner. Client satisfaction—also known as patient-centered care—is a driving force for any clinic owner. Providing services that go above and beyond what a client could receive elsewhere is essential for maintaining a healthy practice. Doing so engages the patient more intently on their healing journey, and has a side effect for the business owner in that patients will want to return to them for guidance on their path to better health. To have a successful practice, we as practitioners must know what is important to our patients and what patient-centered care means to them. The Institute of Medicine defines patient-centered care as “Providing care that is respectful of, and responsive to, individual patient preferences, needs and values, and ensuring that patient values guide all clinical decisions.”1 This definition is useful for caregivers, but is it how a patient would define this concept? 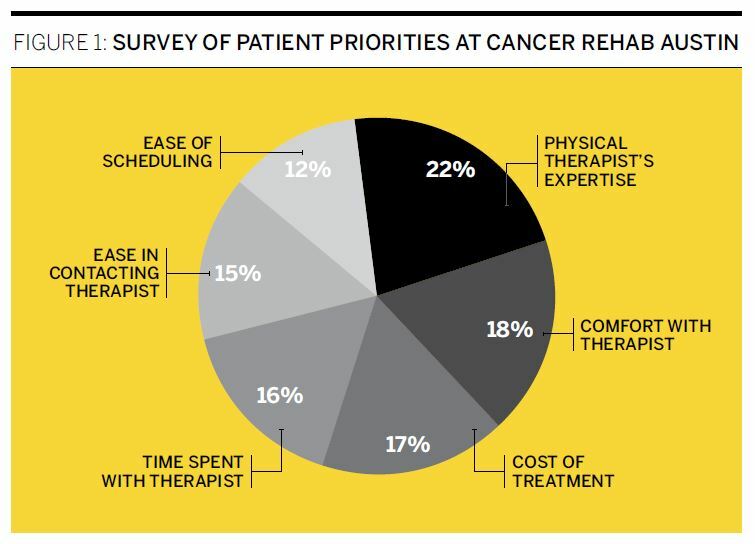 At Cancer Rehab Austin (CRA), we conducted a survey with oncology patients asking what patient-centered care means to them and what they would prioritize for their physical therapy care (Figure 1). We were curious if an oncology patient who receives varied forms of treatment, from radiation, chemotherapy, to surgery, would consider the Institute of Medicine’s definition relevant to them. The oncology population is uniquely suited to enrich our understanding of patient-centered care as they are exposed to many different medical practitioners in a short period of time. The survey conducted at CRA had two components: The first was rating six patient priorities (in order of greatest to least importance to the patient), and the second was an open-ended question: “What does the statement patient-centered care mean to you?” The answers to the open-ended question matched some of the principles outlined in the Institute of Medicine’s definition, which is an indicator that patient-centered care has universal tenets. A few of the answers to the question are discussed in the following. Note the principles that overlap with the Institute of Medicine’s definition, the Picker Institute’s eight principles, and the patient survey conducted at CRA. These principles are core ideals that we as practice owners should pay attention to in order for us to give the best patient-centered care possible. The concept of patient-centered care is multifaceted, complex, and unique to each individual and may encompass more or less points than those cited for each individual. However, if we combine all three definitions we see that the universal concepts found in both research and patient experience can help drive the core patient-centered competencies of our practices. It is becoming harder to take time to learn about a client’s values, preferences, and expressed needs due to lowered reimbursement rates and the decreased value of skilled physical therapy in the current health care model. Clinicians are forced to doublebook, shorten treatment times, and pass off treatments to techs and aides. Physical therapists are frequently seeing patients only for evaluations, reevaluations, and discharges instead of being an active participant in their continuum of care. This may lead to unimaginative patient care from the therapist, and leave the patient feeling undervalued since their expressed needs have not been met. An oncology patient’s team may consist of their medical oncologist, radiation oncologist, general surgeon, plastic surgeon, nurse navigator, physical therapist, dietician, etc. The potential of creating a disjointed and often confusing plan of care increases every time the patient sees a new practitioner. Oncology patients may feel vulnerable or pulled in many different directions when plans of care differ among team members. This is why it is imperative that frequent communication occurs with the other members of a patient’s health care team. This can be achieved through documentation, phone calls, emails, and faxes. Letting your patient know that you are in contact with their other health care team members tells them that you are working to ensure they are receiving the best and most unified plan of care possible. Doing so also shows the patient that you are going above and beyond the current model of PT care, which in turn helps them be more engaged in their treatment because they see that you are. Better treatment outcomes lead to better reviews about your practice, which can lead to more word-of-mouth referrals. Patients’ immediate access to information via the internet requires that we adjust the way we inform and educate patients all the while being sensitive to their expressed needs. We must understand that they are coming into our office with some information about their diagnosis. We must find a way to lead them in the direction of evidence-based and reputable websites and help them navigate through this mass of information successfully. Efforts devoted to their full understanding of what they are going through can help build confidence and rapport between the patient and practitioner. It also helps the patient identify with you as a fully engaged member of their health care team. A good example of why we need to be sensitive about education comes from the oncology patient population. Cognitive changes such as memory loss and difficulty focusing are frequent side effects of chemotherapy. Therapists must have all educational information in written form for the patient to access so they can review it on their own time and as frequently as needed. Written material is fine for later use, but we must be able to assess a patient’s communication style and modify our language accordingly when we are in a session with them. The ability to change the way we speak depending on the patient is vital to their compliance and trust. The more the patient trusts that we are there to help them and to empower them with education, the more they will be engaged with their plan of care. Owning a private practice allows a practitioner to create an ideal environment for healing. The practice owner is not tethered to the limitations of a hospital setting. This means they can create an environment that helps release patients’ emotional burdens associated with being in a hospital setting. Patients dealing with disease or injury often feel a lack of control, either through poor education about their diagnosis or being pulled in many competing directions by the medical team that is dictating their treatment to them. One out of every two patients you see in the oncology population will be suffering from anxiety or depression.4 This is a significant number of patients who need extra help to become fully engaged in their plan of care. 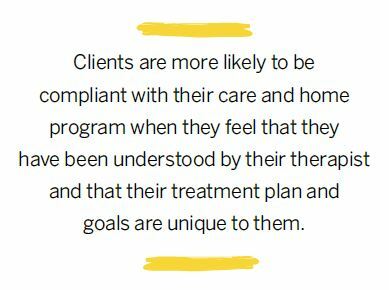 Creating a space for your client that helps them feel safe, comfortable, and able to focus on their therapy goals will allow for improved patient satisfaction and outcomes because the cognitive burden brought about by their anxiety will be diminished. 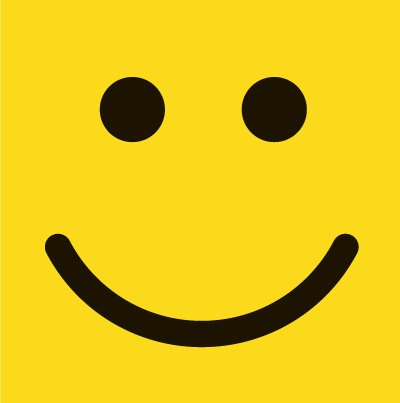 An important aspect of customer satisfaction is empowerment. Patients in the oncology population spend a year or more being monitored very closely by their medical team with daily or weekly appointments. Then, for many, there comes a day where those appointments drop significantly. It is common for them to feel abandoned, confused, and lost after developing such a reliance on the practitioners around them. It is our job as physical therapists to educate our patients on how to care for themselves for the long term through home exercise programs and lifestyle changes and maintenance programs. They can then know that their therapist is there for them while gradually becoming more and more independent. Insurance companies dictating patient care present one of the most difficult challenges we face in health care. Due to low reimbursement rates, practices may have to reduce treatment times, book multiple patients in a single time slot, and rely on the use of aides and technicians. Patients may be discharged not because their goals have been met, but because their benefits have run out. There is no easy solution to these challenges as our current health care system is fundamentally based on insurance. Insurance-based clinic models allow for access to care in those with limited means, but it may not be the solution for getting the best patient-centered care for all individuals. Cash-based, out-of-network clinics can be an alternative to insurance-based clinics as they eliminate some of the barriers to patient-centered care. Longer treatment sessions with a single patient offer more time for patient and caregiver education and the ability to perform multiple interventions and modalities. 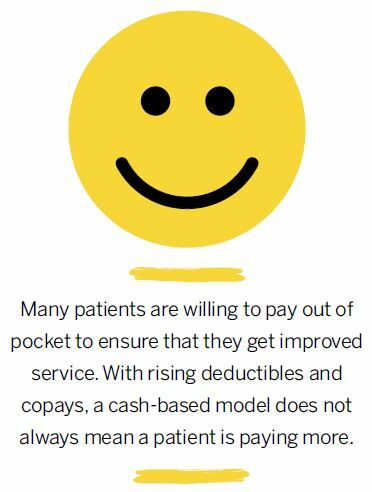 Many patients are willing to pay out of pocket to ensure that they get improved service. With rising deductibles and copays, a cash-based model does not always mean a patient is paying more. Both the traditional model and cash-based models have their pros and cons, but both models should be considered relevant avenues of care for patients. Private practice owners must align their practice with what patients consider patient-centered care. Examining the similarities and overlap among patient-centered care concepts such as those described by the Institute of Medicine and the Picker Institute, and listening to your patient’s preferences and needs will help create a memorable health care experience. Incorporating patient feedback is what brings value to our services. Patient satisfaction and positive outcomes are what will make a successful practice in the ever-changing world of health care. The one constant will always be the patients. Patients are the driving force of our profession and businesses’ success. 1. Institute of Medicine (U.S.) and Committee on Quality of Health Care in America. Crossing the Quality Chasm: A New Health System for the 21st Century. Washington, DC: National Academy Press, 2001. http://public.eblib.com/choice/publicfullrecord.aspx?p=3375215. 2. 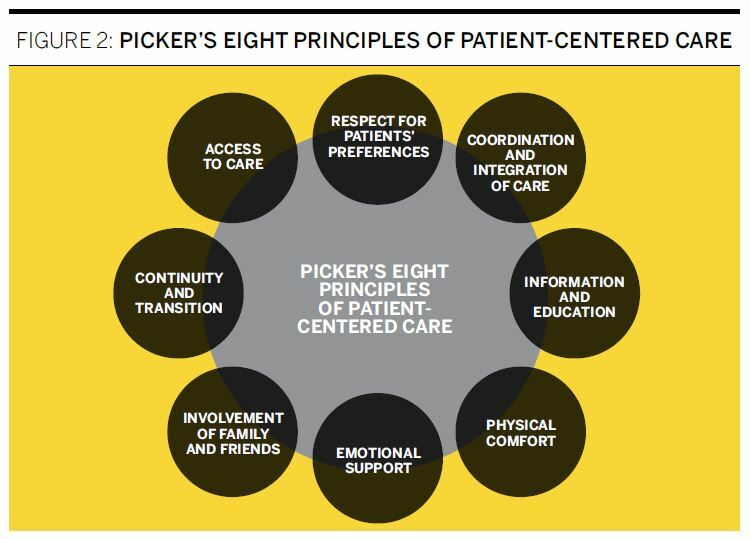 The Eight Principles of Patient-Centered Care. www.oneviewhealthcare.com/the-eight-principles-of-patient-centered-care/. Accessed February 25, 2017. 3. 6 Reasons Why Customer Service Is the Most Powerful Word-of-Mouth Marketing Weapon. https://web.archive.org/web/20160803011009/http://bright.stellaservice.com/uncategorized/have-you-heard-6-reasons-why-customer-service-is-the-most-powerful-word-of-mouth-marketing-weapon. Accessed February 26, 2017. 4. Nikbakhsh N, Moudi S, Abbasian S, Khafri S. Prevalence of depression and anxiety among cancer patients. Caspian J Intern Med. 2014;5(3):167–170. Dr. Angela Wicker-Ramos, PT, DPT, CLT-LANA, is the owner, oncology rehab physical therapist, pelvic floor therapist, and certified lymphedema therapist at Cancer Rehab Austin (www.cancerrehabaustin.com). She can be reached at angela@cancerrehabaustin.com.